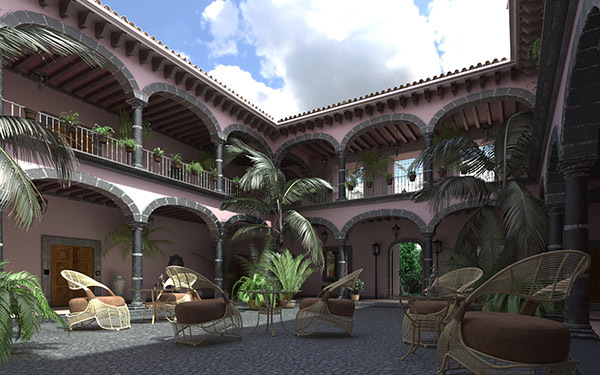 A lot of professional 3D modeling work relates to architectural projects. For large scale developments, there is usually a site development or campus development element in addition to the buildings and other structures. Good site modeling is critical to creating an acceptable model for client projects because the environment needs to complement the structures. This video comes directly from SketchUp & walks you through the steps to create a site model. Some highlights are how to use a mix of Google Earth & Google Maps views to understand the site; modeling new buildings from scratch; and creating utility scenes for studying. You expect an official SketchUp tutorial to be pretty sweet and this one doesn’t disappoint. If you’re not into architectural rendering, then this may not be that fun to you, but I think most people doing models will appreciate the techniques and how he shows the capabilities of SketchUp. If you haven’t already, then make sure you subscribe to the SketchUp YouTube channel. Building architectural models from the ground up takes imagination, an eye for detail, and a solid understanding of your tools. In this video, we see a Thai Temple developed in SketchUp 2015 with the addition all the shapes, dimensions, spacing, materials and textures shown. The video, from JMsketch04’s YouTube channel. It’s longer than most of the videos we share (38:03), but it’s worth the time. I especially like the order of the modeling with a good use of library assets and a consistent workflow. If you’ve ever tried building a complex models or ones with lots of assets, then you know that you need an efficient process to make sure everything comes together and avoid having to redo work later. If you’re new to SketchUp modeling or want to learn how to build models more efficiently, then checkout this video. The images you use as sources and output have a big impact on the realism of your renders. This video from dimensiont on YouTube looks at the value of using HDRI images when doing renderings. I think the video could use a different soundtrack, but the examples given are convincing. In the video, you’ll see the difference in colors, shadows, lighting and reflections between high dynamic range images and formats like jpeg and png. The video does a great job of making the difference in contrast and detail obvious. It also gives you some hints to the value for different lighting environments though I’d say the video could use more lighting examples. Watch this video if you’re working on placing made objects and people into real-world environments or struggling to fine-tune a render. Found this video on the HappieCat YouTube channel. This video is focused on rendering in games, but it does a great job of explaining the basics of 3D modeling including the different technologies and math behind it. I work for a 3D rendering and visualization company, but my background is in marketing. While I’ve learned a lot working with FluidRay, this was actually a great video for me to learn a little more about the concepts behind modeling. I definitely suggest this video to anyone looking for a very straightforward explanation of what goes into modeling, especially if you like video games. FluidRay RT Tutorial on how to quickly get started with the integration plugin for Luxology Modo. In this tutorial we are going to cover step by step the process of taking a 3dsmax scene, exporting it in .fbx, and rendering it using FluidRay RT. The following are a couple of examples of the results achieved. 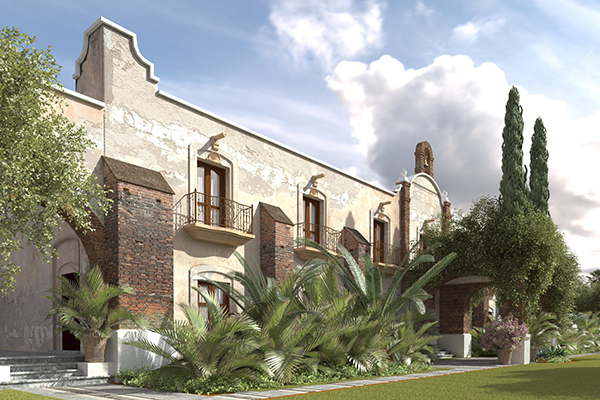 The original scenes were taken from Evermotion Archexteriors collection and originally came as 3dsmax scenes with textures, materials and cameras setup for VRay. Note that this tutorial applies to all 3dsmax scenes, not only those setup in VRay. For XRefObjects, make sure to uncheck the “Enable/Use local” checkbox, so that the full resolution mesh is used (see screenshot). For VRay objects, we need to convert them to standard 3dsmax equivalents, so that they can be properly exported. For textures, there are some nodes that are not handled by the exporter, such as color correction nodes or texture mixing nodes. In those situations, we need to remove the color correction nodes and connect the bitmap textures directly to the material. We provide a Maxscript that does all this work automatically. Right before exporting, load the script in the Maxscript editor and press Ctrl+E to execute the script. You can get the script in the Addons Page. We are going to use the Autodesk .FBX format to export the scene to FluidRay RT. In the FBX exporter options, make sure that the to select “Preserve Instances”, “Y-Up”, “Binary” (see screenshot). The “Preserve Instances” options allows to keep instanced geometry as it is in 3dsmax, instead of duplicating the mesh information an wasting a lot of memory. FluidRay RT will then preserve the instanced geometry as well. 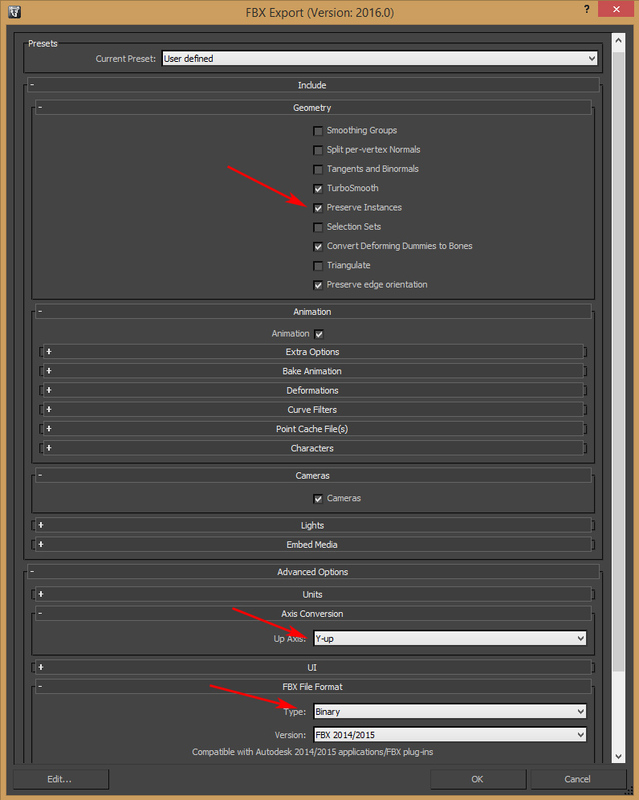 The “Y-Up” option converts the axis orientation from the “Z-Up” 3dsmax convention to FluidRay RT‘s “Y-Up” convention. The “Binary” option is suggested to keep the exported files to a manageable size. Just start FluidRay RT, then go to File->Import and select the exported .fbx file. There are a few things that need to be adjusted to get the best results: Bump Mapping, Organic Materials and Cameras. Bump Mapping – The bump mapping texture is exported correctly, but the amount of bump needs to be adjusted. Select the material, then in the Displacement section adjust the “Amount” parameter until it’s visually satisfying. You can use the browser preview to make the process easier. Organic Materials (Leaves, Flowers and Plants) – The exported material is not the best suited for plants. To achieve the best result, we need to change the standard scattering of the material to “Glossy Diffuse Translucent”. 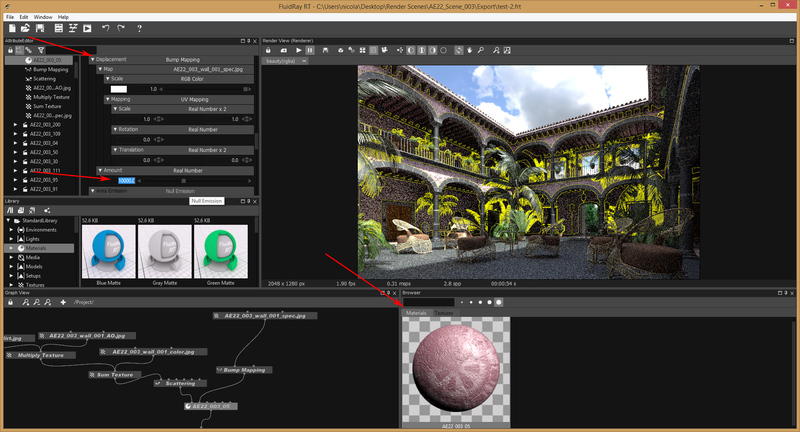 In order to do that, select the material, then, in the Graph Editor, right click on the scattering input of the material and click on Connect to a new -> Glossy Diffuse Translucent. If the original scattering had a texture attached to the diffuse input, you need to connect the texture to both the Diffuse input and Transparency input of the Glossy Diffuse Translucent node. You also probably want to increase the Roughness parameter to 0.1. Cameras – The camera position and orientation is exported, but, due to some limitation in the .fbx import library, you will need to adjust the FOV and Camera Shift/Camera Tilt if present. We shown the process of converting a 3dsmax scene to FluidRay RT. The process is pretty straightforward and normally doesn’t require much tweaking. Once you get the hang of it, it should take no more that 20-30 minutes to have a fairly complex scene ready to render in FluidRay. If you want a more in-depth knowledge about FluidRay RT, check out the Help Page. Also, if you have further questions, fell free to post on the Discussion Forum. 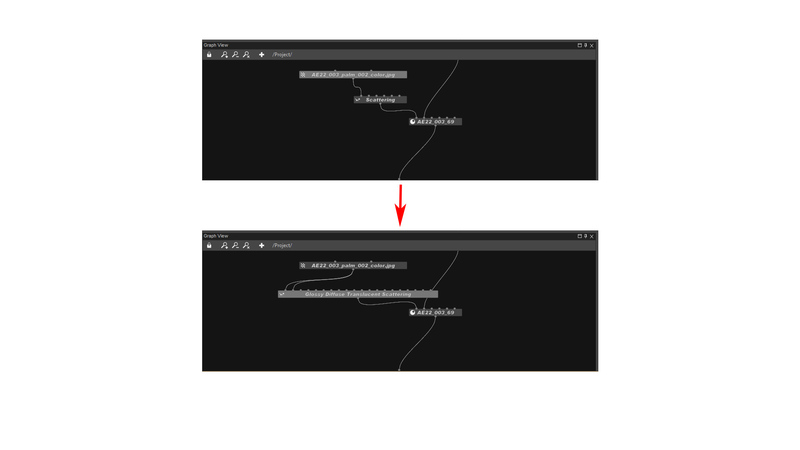 Right before exporting, load the script in the Maxscript editor and press Ctrl+E to execute the script. The export format that provides the best results is .fbx. Get this script in the Addons Page. How to combine and adjust different light channels separately without redoing the rendering. This tutorial builds on top of the Light Channels Tutorial.